This help article describes how to use plot building tool. 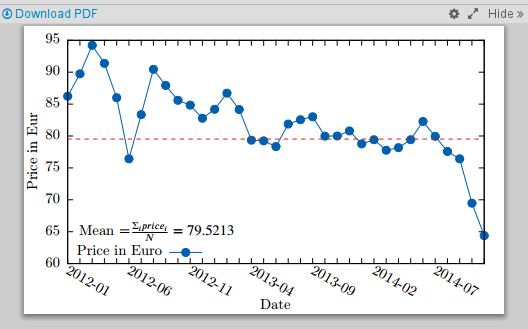 Country                "Production (mln bbl/day)""  "Share of World \\%"
Adding a plot into LaTeX document involves a few steps: one needs to create a plot itself and then insert a plot into the text as a figure. In Papeeria you can do all this stuff quickly: place caret where you want to add figure tags, hit Alt+Insert and choose Insert Plot from the context menu. Paste your data into the text area, choose file name where data will be saved to, choose column delimiter and optionally figure caption. Click Done and Papeeria will add data file into the project, compile PDF file with a histogram and insert figure tags at the caret position. When data file is opened in the editor, it is possible to preview the compiled plot by ticking "Show plot preview" checkbox. We refresh plot in the preview as you type. If it fails to compile because of error in data or some other reason, we show a cached plot. Cogs icon above the editor with opened data file provides access to plot settings pane. You can change plot style, data columns delimiter, position legend appropriately, define axis names, change ticks format and rotation. Most of the options are quite simple, with tics label format being the most tricky. Please refer to gnuplot docs to learn about format specifiers. At the moment we take tic labels for X axis from the first column in the data file. Behind the scenes we compile plots with gnuplot and xelatex. Users of free Epsilon plan don't have many tuning options, however, customers who are subscribed to paid plan Delta have access to raw gnuplot scripts and can enjoy almost all gnuplot features. Let's build a graph of oil price changes and tune it a little bit. Quick plot created with Insert Plot action looks as shown below. We want to make X tic labels less dense, change colors and line style a little bit and add a dashed line at the mean value of oil prices. So let's start with exporting our plot to gnuplot script. Click Export script button, choose script file name (it is important keep .gnuplot extension) and location and leave Use as input checkbox switched on to feed your data to the generated script. Open the generated .gnuplot file in the editor and paste the following code. We hope comments in the code are explanatory enough. set ylabel "Price in Eur"
# '<&3' takes input from the file with descriptor number 3. # generated a script then your data file will be associated with this descriptor. # Placing label on the plot. Yes, you can use LaTeX! # this function returns non-empty string with the value of column number "labelcol"
everyfifth(numcol, labelcol) = (int(column(numcol)) % 5 == 0) ? stringcolumn(labelcol) : ""
Now we can go back to our text and compile it. Figures are already there, we may need to adjust their placement using optional argument of the figure environment and enjoy the result. Plot labels are compiled with xelatex, so you can use maths and other LaTeX features. 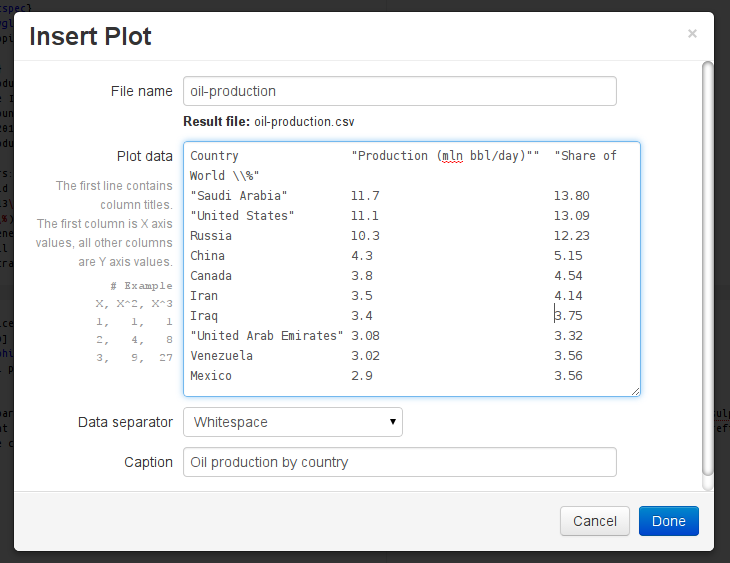 You may want to create different scripts and choose which one to use to process your data file in the plot settings pane. You can also link a few data files to the same script, and they will recompile automatically when you change the script file. At the moment being plots don't play well with project versions and project clones. We are working on this and will fix the issues shortly. We plan to enhance plot builder capabilities and add other plotting systems. Don't hesitate to file tickets to our bug tracker or uservoice! Love Papeeria? We need your feedback! We'll appreciate if you take a few minutes of your time and write a review on our Google Web Store pages. Any language is okay and no flattering is required. Just be honest!